Hearing your own work read for the first time by actors is both exhilarating and terrifying in equal measure. It somehow makes it real, takes it out of your head and brings it to life. It’s a strange experience, after carrying the world of the play around in your head for so long. To hear it spoken by other voices throws up so many new ideas that it can be difficult to jot them all down. They tumble out. 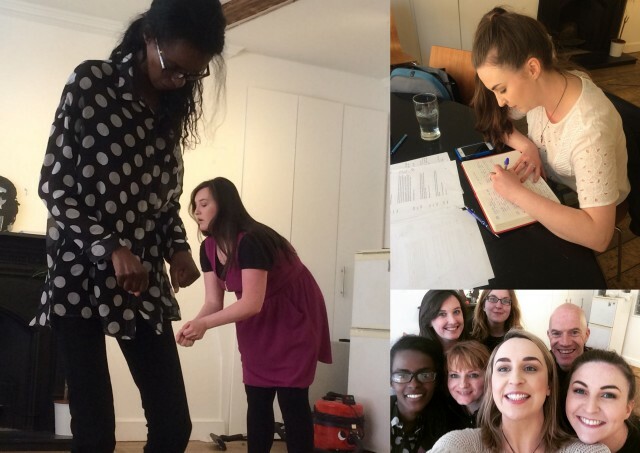 Last week we got to do a development week on ‘Displace’ as part of the Belltable residency. It was an amazing experience, to get to develop a work-in-progress with such a great team of supportive people. 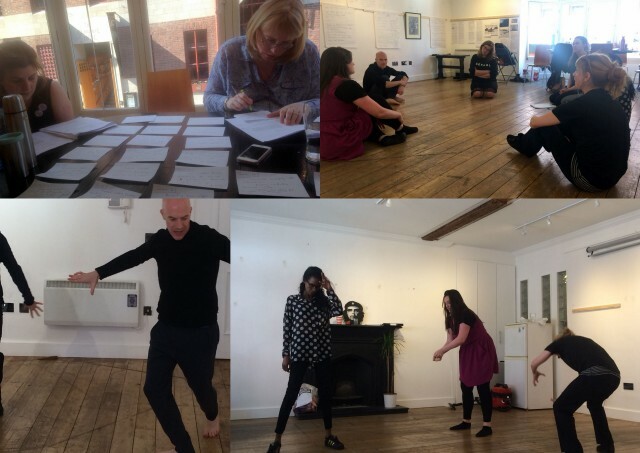 Our actors were Sahar Ali, Roseanna Purcell and Niamh McGrath, with Sarah Baxter directing, Bryan Burroughs as movement director and Pamela McQueen as dramaturg. As Bryan put it, it was great getting the opportunity to work ‘just us girls’ :-). We started by reading through the script a couple of times to get familiar with the story and characters. I don’t think I breathed for the first read. But everyone was so positive and supportive that it made it much easier than I thought it would be, and I relaxed. They gave some great feedback on the script, what parts really worked and suggestions for parts that weren’t quite there yet. I went home after the first day feeling energised and excited to start rewriting. The movement days were Bryan were invaluable. Very often when I’m writing, I become overly reliant on words at first; they are a safe area. No playwright wants to have blank paper staring at them. But through the movement exercises you begin to see what can be spoken and created through the actors’ bodies on stage, and sometimes it can be far more affecting and powerful in the absence of words. Particularly in the two worlds of the play, where language is so different. In the Laundries for example, the women were forbidden from talking to each other. They only spoke in prayer. Yet friendships were formed secretively, a whispered, hushed form of friendship. In the direct provision centres, language can be a barrier between people from different countries and cultures, often when they are sharing rooms. It creates a whole new level of integration that has to be dealt with. The body can sometimes tell us what words cannot, and this can be particularly interesting on stage. One of the days was spent with myself, Pamela and Sarah dissecting the second draft of the script, pulling it apart and then putting it together again, to see what structure works best to tell the story we want to tell. This was a really helpful experience as a writer, because so often we can get stuck in one way of thinking; it can become difficult to see different paths the story could take. But opening up to get new perspectives on it can lead to interesting discoveries about the characters and their individual journeys in the story. After so many great chats, exercises and ideas, I’m scribbling away like mad to get a new draft ready for the rehearsed reading on June 20th in the Belltable. This will be a new step for me as a writer, I’ve never done a reading of a work in progress in front of an audience before so it’ll be brilliant to see what new ideas it sparks!